[toc]Nowadays many people are suffering from thyroid disorder. Actually the thyroid gland in the neck generates hormones that stand significant for your regular metabolism, constructive energy levels, average body temperature, steady weight and proper digestive function. But you may undergo hypothyroidism when your thyroid will generate extremely less hormones thus slowing down many bodily functions, and bringing on associated illness. You may also have hyperthyroidism when too many hormones are generated by the thyroid with the increase in metabolism forming many difficulties. You’ll come across signs of thyroid problem such as lethargy, weight gain, fatigue, gloominess, eczema, hair loss, dry skin, PMS, hoarseness, low libido, swollen feet and legs, poor immune system and brittle nails. But thyroid disorder can surely be treated with the doctor’s medicines, a healthy diet and accurate exercises. With the help of effective home remedies you can definitely manage your thyroid hormones adequately and also lessen its symptoms too. You can refer your doc which home remedies will be appropriate for thyroid problem depending on your symptoms. 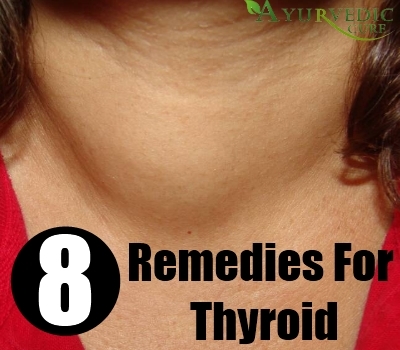 We’ve presented below 8 useful home remedies for your thyroid problem. 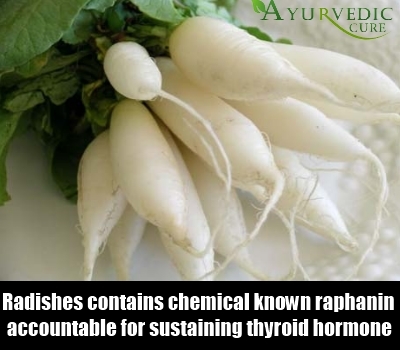 In order to control your thyroid hormones, radishes will be a great home remedy. It contains chemical known to be raphanin that is accountable for sustaining the thyroid hormone at average level, be it hypothyroidism or hyperthyroidism. You can prepare red and black radish curry by slicing the radish pieces. You can also make a glass of radish juice and drink it once or twice a day for few days till you recover from the thyroid problem. 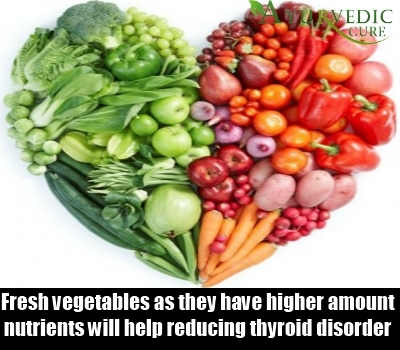 You should have diet that consists of fresh vegetables as they have higher amount of nutrients that will help in reducing the thyroid disorder. You should intake dark green vegetables such as broccoli, spinach, collard greens and kale, and yellow vegetables such as pumpkin, squashes, corn and Rutabagas containing higher Vitamin A that can enhance the iodine absorption. You should also ingest sea vegetables rich in iodine such as kombu, hijike, nori, arame and wakame. Take these foods alternatively on daily basis in your meal. 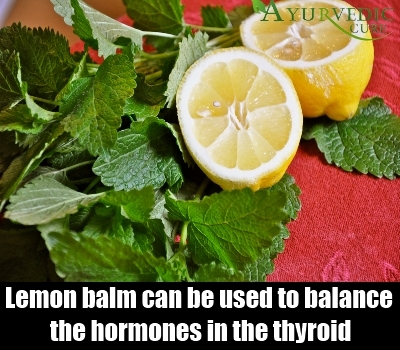 Lemon balm can be used to balance the hormones in the thyroid. It is really beneficial for those suffering from hyperthyroidism as lemon balm will aid in lessening the excessive hormones to the normal level. You can apply the lemon balm in extract form. You can even prepare tea with lemon balm and drink it once a day for some days to gain better outcome. Kelp which is high in iodine is an important mineral that is essential in functioning of thyroid. The amount of kelp seaweed you intake and the frequency of dosage will rely on your thyroid illness and your body metabolism, and thus it should be eaten as referred by the doctor. You can ask your doc how much kelp to add in your cooked food. When the hormones in thyroid lower, kelp helps to increase the level. Low iodine in your body is a sign of danger. 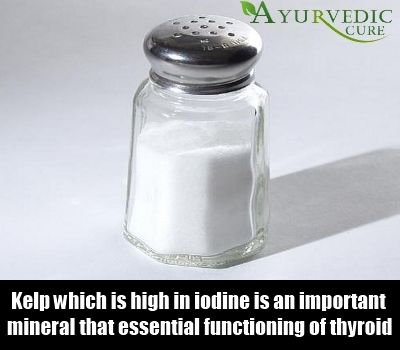 It requires correct amount of iodine to built hormones. 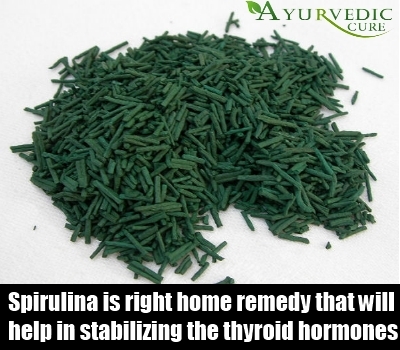 Thus spirulina is a right home remedy that will help in stabilizing the thyroid hormones. You can use spirulina in the form of capsules with the advice of doctor who can tell you how much dosage will be precise for your thyroid problem. 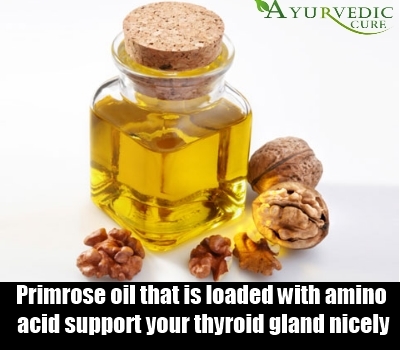 Primrose oil that is loaded with amino acid will support your thyroid gland nicely. You can apply the oil around your throat from outside or you can prepare tea by adding drops of primrose oil. Black walnut that is rich in iodine and extra dose of manganese will aid in absorbing iodine in your body. You can either have it directly or else add it in the curry. Agnus castus will aid in sustain the estrogen levels that further controls your thyroid. It is necessary to enhance your physical activity. Do not lead an inactive lifestyle due to obesity. Try lifting both your legs alternatively till your energy level increases to a great extent. 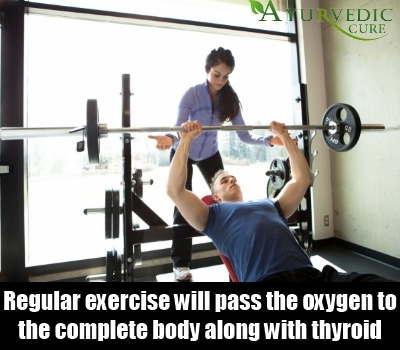 Doing regular exercise will pass the oxygen to the complete body along with thyroid too. Thus your thyroid will also get into shape by exercising for half-an-hour or one hour. You can also perform another exercise by lying on your back as you massage the abdomen portion for 1 minute. You have to place one hand on the throat, breathe out and begin creating sound with each exhale. You have to repeat this exercise for 5-10 minutes per day so that your thyroid problem will ease down gradually. With doctor’s suggestion you can take one capsule of vitamin B complex daily that increases the capability of your cells so that it can improve your energy, help receive better oxygen, aid in functioning of thyroid, digestion and also immunity. 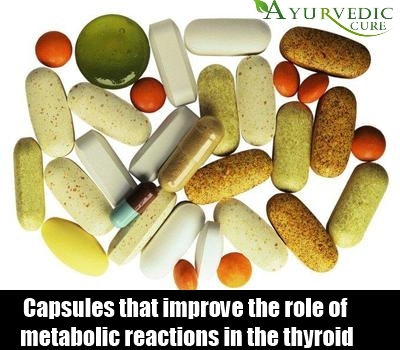 You can also have minerals such as iron, calcium, zinc, iodine, chromium, zinc and selenium in the form of capsules that improve the role of metabolic reactions in the thyroid. These can also be taken in the form of food sources. Therefore patients can certainly make the best use of the above home remedies for thyroid.